A new infrared mosaic from NASA's Spitzer Space Telescope offers a stunning view of the stellar hustle and bustle that takes place at our Milky Way galaxy's center. The picture shows throngs of mostly old stars, on the order of hundreds of thousands, amid fantastically detailed clouds of glowing dust lit up by younger, massive stars. The Milky Way's core is indeed a very busy place. Stars are packed together like subway riders as they race around the supermassive black hole that lies at the center. Our sun is located 26,000 light-years away in a more peaceful, spacious neighborhood, out in the galactic suburbs. It circles the galaxy about every 225 million years, which amounts to 20 trips over the course of its 4.5-billion-year lifetime. In contrast, stars at the galactic center complete one lap in only a few million years or less. "One question we hope to address is how stars can form so efficiently in a place like the galactic center," said Stolovy. "Stars there are still able to form in an environment with unusually strong magnetic fields and tidal shear forces." Viewing the center of the Milky Way from Earth can be difficult because the plane of the galaxy's spiral disk is filled with cold dust. Visible light coming from this distant region is virtually impossible to observe because dust dims it by a factor of one trillion. But infrared light can shine through this dust. The infrared light in this Spitzer view has wavelengths about 10 times longer than what the human eye can see, and is dimmed only about four times. 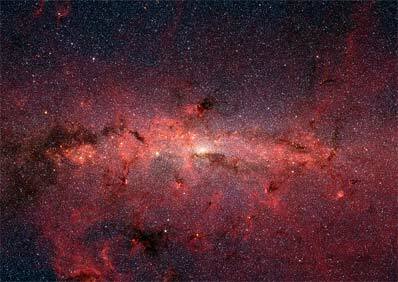 This infrared advantage, combined with Spitzer's superb image quality, has resulted in the deepest and sharpest view yet of an expansive stretch of the galactic center. The pictured region, located in the Sagittarius constellation, is 900 light-years across. It covers the same area on the sky that a grid of four by three full moons would occupy. Features within the new mosaic include dust clouds of a dizzying variety, such as glowing filaments, wind-blown lobes flapping outward from the plane of the galaxy, and finger-like pillars. The Spitzer image also shows newborn stars just beginning to break out of their dark and dusty cocoons, and exquisitely detailed dark clouds so dense they are opaque even in infrared wavelengths. Some of these features are located near the physical center of our galaxy, while others lie closer to Earth. "Our Spitzer data, combined with data obtained by other telescopes, will allow us to determine which of these objects are truly at the galactic center, and which are in spiral arms along the way," said Stolovy. "This survey will help us to better understand the mass distribution and structure of our own galaxy and how it compares to other galaxies." Stolovy and her colleagues are particularly thrilled about the high quality of the Spitzer image when they remember the challenges they overcame in obtaining it. The galactic center is very bright in infrared wavelengths, and could have potentially saturated Spitzer's sensitive detectors. The astronomers solved this problem by taking advantage of Spitzer's ability to take very short exposures. They collected the thousands of snapshots that make up their final mosaic in just under 16 hours. The Jet Propulsion Laboratory manages the Spitzer Space Telescope mission for NASA's Science Mission Directorate, Washington. Science operations are conducted at the Spitzer Science Center at Caltech. JPL is a division of Caltech. NASA's Goddard Space Flight Center, Greenbelt, Md., built Spitzer's infrared array camera, which took the new image. The instrument's principal investigator is Dr. Giovanni Fazio of the Harvard-Smithsonian Center for Astrophysics. Stolovy presented the image today during the 207th meeting of the American Astronomical Society in Washington, D.C.